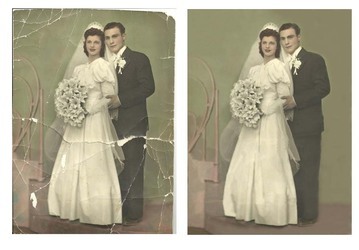 For photo restoration work please contact us via email enclosing a copy of the original image, describing the restoration work that you require carried out to the photo; we will evaluate the correction work requested and reply with an all-inclusive quotation. The quotation will only be valid for the work described. ​If the quotation is acceptable please use one one of the following services to send us your image/s: medium image up to 6 megs can be sent by email, larger images can be sent using Google drive or send digital images by post address on application using a proper photo envelope (cardboard backed envelope) available from any Post Office. Typical Restoration cost between £20 and £30. All prices quoted are inclusive. Pricing is calculated using two factors. Time needed to complete restoration and skill level required for the restoration. We guarantee the price we charge will match the restoration time. We invoice via email and payments are made Via Paypal it’s that easy; it’s convenient, secure way to pay, remember you do not need a Paypal account to pay. Email us your photos for retouching, remember to include instructions. For large orders we recommend dropbox. We will amend the work until you are completely satisfied. Only then, will we invoice you by email. Upon payment, the final retouches will be sent to you. Please note that severely damaged photos are more labour intensive so may cost extra. For £6.00 you can request a disc containing the high resolution image allowing you to print further copies.